This is not the start of an ongoing series but having posted a photograph of one drain then - a bit like with biscuits - it’s difficult to stop at just one. 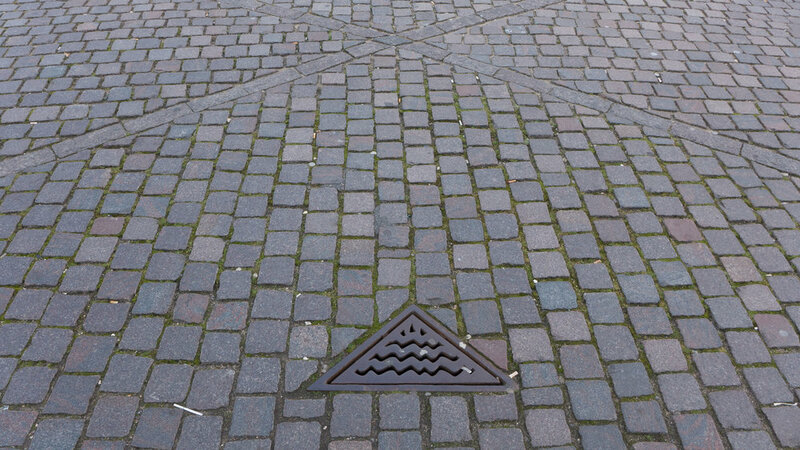 The triangular drain is on the outer part of the paving at the centre of Kongens Nytorv where there is a chevron pattern in the stone setts. Diagonal lines are fairly common around the city as a way of diverting surface water towards a drain but here it becomes a giant pattern laid out around the central equestrian statue and the drain covers respect the pattern. They have a stylised version of the water of the harbour that is part of the city crest. 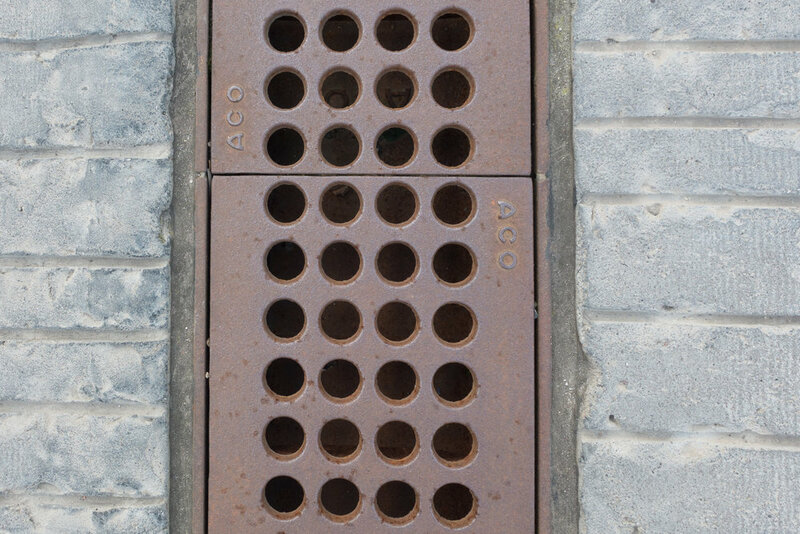 On Ofelia Plads the long drains running across the new public space have pierced iron plates and the inspection covers pick up the same size of small circle but they are reversed to form projecting studs so that the surface provides more traction when they are wet. With large building projects in the city it is rare to see evidence that the architects have turned to a junior in the drawing office and said … “I really don’t care … just pick anything from the catalogue that fits.” In Danish design every detail should matter even if most people don’t notice … even when they are standing on it. The two examples from Ørestad on Amager are included - in part because they are interesting and in part because they are very much in the middle of a huge building site as this phase of new apartments is finished. Canals, trees and hard landscaping are in as work progresses so people moving in first have at least some semblance of a normal street outside their door. These are not so much drains as iron inspection covers. HOFOR is the Copenhagen water company. Looking on their web site recently for something else I came across an aspect of city planning that I had never thought about before. There was a heading and a link to a post on heat seeking drones and it turns out that on Amager the communal heating system has pipework that if stretched out would get to Rome and then all the way back. That is partly why there are so many iron covers with some for drainage systems and others for utility services like the communal heating. The drone is used to identify leaks in the system and it works best if it is flown when it is dark and the roads are dry and it has to be flown in co-ordination with the airport. So next time the flashing lights of a drone appear immediately above you they are probably not interested in you at all but what you are standing on.